What Happens When You Square a Square Root? Remember that addition and subtraction are opposite operations and multiplication and division are opposite operations? Turns out, squaring and taking the square root are opposite operations too! See why in this tutorial! How Do You Figure Out if a Square Root is Bigger than Another Number? 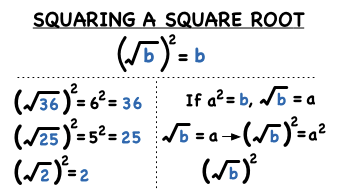 Comparing a square root to another number can be rough, unless you remember that squaring is opposite of taking the square root. Then things get much easier! See how it's done in this tutorial.